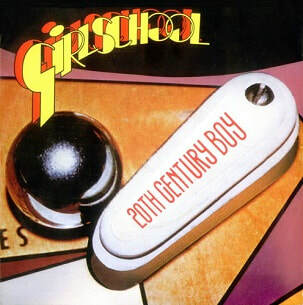 20th Century Boy is a single from the British heavy metal band Girlschool, released by Bronze in October 1983. A cover of the 1973 T. Rex hit, "20th Century Boy" was written by Marc Bolan, with Girlschool's version produced by Jim Lea and Noddy Holder. It was released as the first single from their fourth studio album Play Dirty. In October 1983, both Play Dirty and its first single, "20th Century Boy", was released. While the single failed to chart, Play Dirty reached No. 66 in the UK, which was considered a commercial disappointment, while a lukewarm reception was received by fans and critics. A music video was filmed to promote the single. The band also performed the song on UK TV show The Saturday Show. "20th Century Boy" was released on 7" and 12" vinyl by Bronze Records in the UK, Australia, Germany, the Netherland and Spain. The B-side, "Breaking All the Rules", was included as an album track on Play Dirty. The 12" vinyl version of the single featured an additional B-side, "Like It Like That", which was exclusive to the single but later appeared on the 2005 Sanctuary Records CD re-issue of Play Dirty as a bonus track. Sunie of Number One said: "Tinny re-tread of a T. Rex oldie. It wasn't Marc Bolan at his best, and the song sounds no better in a leather jacket than it did in satin flares." David Ling of Number One said in a favourable review of Play Dirty: "The cover of "20th Century Boy" is a joy to the ears."